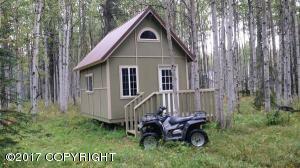 DESCRIPTION: Great get-away cabin in Sterling with loft. Near Scout Lake and everything the Kenai Peninsula has to offer. Fish the Kenai River or fish and hunt the Kenai Wildlife Refuge. Cabin has a direct vent propane heater installed and a outhouse. DRIVING DIRECTIONS: At mile 84.7 of the Sterling Hwy turn on the paved Scout Lake Loop Road. Turn right on Tuffy Lane. Follow on around to end of road.